Private tease likes to meet at base, mini dress with attached garters, scarf, hat and dog tags are included in this 4 piece costume. Shown with hose #1739.
Business school girl short sleeve mini dress with attached suspenders and a tie included in this 2 piece costume. Dust devil naughty maid mini dress, apron and arm bands are included in this 3 piece costume. Shown with hose #1775. 5 piece Monster Mistress Costume includes halter dress with lace up bodice, gloves, arm bands, thigh hi's and hat. Naughty nurse. Short sleeve mini dress with zipper and Hat included with this 2 piece costume. 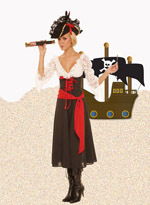 High seas vixen looking for the islands long sleeve dress with lace sleeves, lace up bodice, scarf, telescope and hat are included in this 4 piece costume. 3 piece Trophy Rack Costume includes mini dress, cami top and hat. She's got the biggest rack in the woods.